This post’s TUNE comes from the 2 Bears. I LOVE this song! Of course, obviously I love every song I post about, I wouldn’t post about a song I hated obviously, but this one is particularly good. If you like Hot Chip, and why wouldn’t you, they are amazing, then you will love the two bears (this may be because this is Joe Goddard’s side project who is part of Hot Chip). I love a good electronic beat me, and this little beauty definitely meets, surpasses even, expectations. I also love the whole piss take quality of this video! Please check it out here, and have a little look at their website here. As I mentioned before I’m rubbish in sales, however, recently I picked up this leather jacket which is actual leather(!!!) for just a measly 32 pounds, what a bargain. It’s not your normal leather material, it looks a bit suedy, but I do love it, and considering it’s size 6 (always the same in sales), it actually fits like a glove (a tight glove, but all the same). I also picked up this dress at the same time, it wasn’t on sale, which really seems to surprise sales assistants, but I really liked it so I was having it, end of! It’s a really weird material, feels weirdly like foam kind of stuff, very odd, but at least it shouldn’t go picky and we can have many happy years together. I like the whole shirt under dress detail, it just adds a bit of extra edge to what could otherwise be a very plain look. I stole this idea off my sister, so kudos to her, but all the same, I’m allowed to wear it to. Nice choice of intems. Have a great monday. this is the sweetest dress, love it! Love the dress and the jacket!!! Thanks for the tip, love Hot Chip, so I will check it out. Your dress is so cute! Thanks for stoping at buy blog!! What a fabulous dress and I just love it paired with a motorcycle jacket! I really love this is outfit, its so stylish and chic! Making me want to get out and buy some spring clothes! Love Hot Chip so will definately check out Two Bears, love finding new music. Really like the shirt under the dress, works so well together! You look so cute! Love the elather jacket. Thanks for the visit on my blog. I love this look! I love your hair too. Wanna follow each other? Following you now and I hope you'll do the same for me. your outfit is so cute! i love the print and that bag is sharp! Very cool look ! 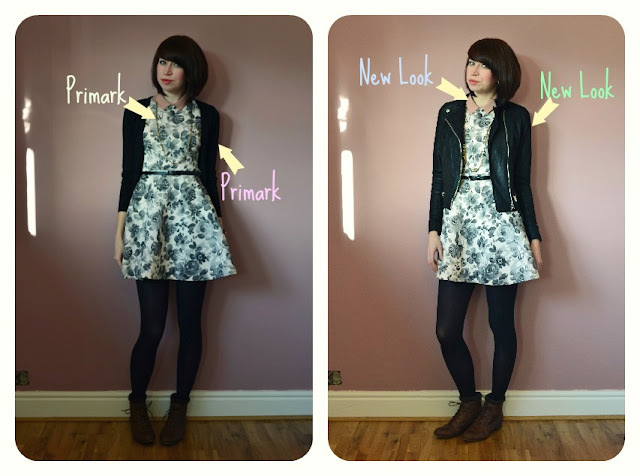 I love New Look ! I'm so happy we finally have it in Paris ! Very cute dress and great styling! I love that dress. Great post. Lovely dress, I love how you accesorized the dress ! Oh, I love your blog <3 :) It's very interesting! HOT CHIP! I saw them perform over the summer and it was one of my favorite concerts this year. oh how i wish to go back to those warm days. and i LOVE your outfit!! the shape of that dress is darling and i love how you layered it. and i want your boots! Amazing look!!! :) I love your dress!! So wish we had Primark here in Australia!! Wow! I love the combo of outfits, especially your shoes in the first picture. Lovely post. Such a gorgeous outfit - really adore that print on the dress!! I love your outfit and your haircut style! I love the color on the dress & really want an asymmetrical jacket like that. adore the look :) you look fantastic! Thanks for stopping by and I really enjoy reading your blog; I love your writing style (how you explain things). I am now your newest follower. Hugs from Florida! The (faux) leather jacket adds an edgy, yet polished vibe, while the floral print creates a feministic touch to this outfit. Amazing dress, dear, & nice pics! I love, love your style! I love your blog! Im following u! the drees is so beautiful! I love new look clothes! i really love your style!!!! your blog is just lovely and i love how you put that outfit together. love dress. suits you so good. Very nice dress and awesome bag!! Very cute! I have a similar dress in yellow. Will have to try it w/ some of your suggestions. P.S. I'm obsessed with jewelry w/ crosses too! awh, lovely dress my dear!! That dress is so pretty, love how you styled it! Molto carino sia il vestito che la giacca (: Reb, xoxo. omg i just discovred your blog and i fell in love with it!!! I too have to admit that I am a MAJOR fan of the shirt under dress look. I have also purchased many collars to create the look without having too many layers on!! wow I'm obsessed with that dress of yours! gorgeous! great outfit do U wanna each it other? Your blog is so much fun! Can't wait to read along now that I've found you! I love Hot Chip but i've never heard of 2 bears, shame on me! Un vestido maravilloso!! Me encanta tu estilo!! I love the leather jacket and the boots!!! So beautiful! Thank u very much Helen! You're so beautiful :) nice look! The boots work great with the dress ;) Also, you've got a lovely design! £32 for that beautiful jacket?! I MUST BUY IT! I love your new picks and they look great on! love the jacket. I can't believe you scored a real leather jacket for that cheap. That is amazing. you look very chic. 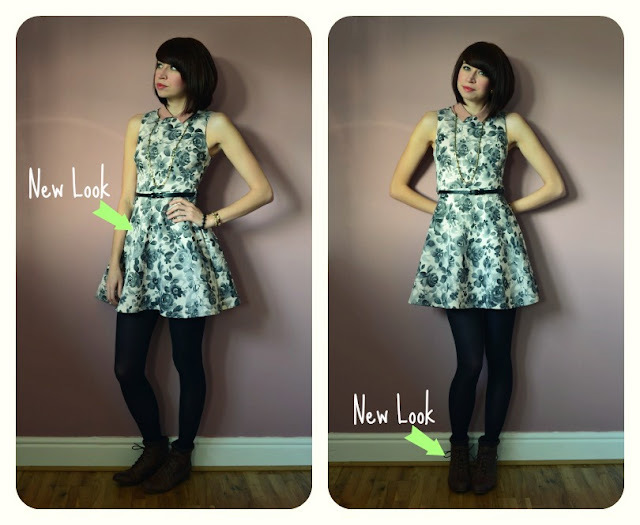 and you look really cute in this vintage-inspired floral dress! Leather jacket's a great match! And thank for you very lovely words on my blog - hope to see you sometime again! 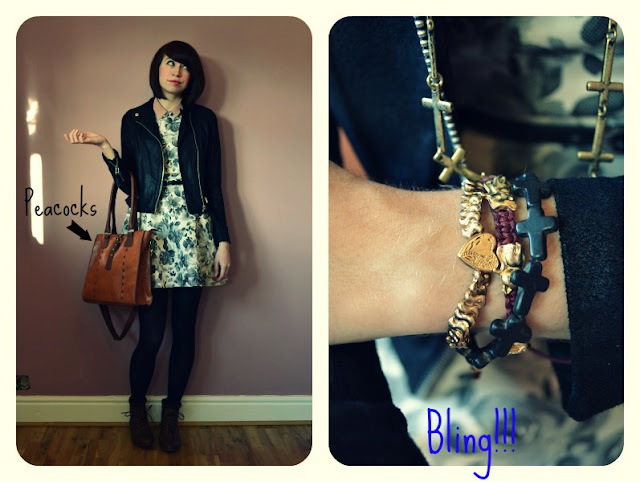 That dress looks so good with the biker jacket, a mixture of cute and edgy!! love those bracelets,and that dress looks great on u ! Thanks so much for your comment on my blog !! Following you, hope you do the same! I LOVE the print on your dress!! It's still a pretty good bargain, even not in the sale! What a super cute dress. I love it with the jacket. You look gorgeous!